Never before has it been this easy to offer your petrol station customers electronic invoicing. This can be achieved by using FuelPortal, the innovative cloud platform for the petrol market. e-Invoicing is much cheaper than invoicing on paper and much more secure than invoicing via email. 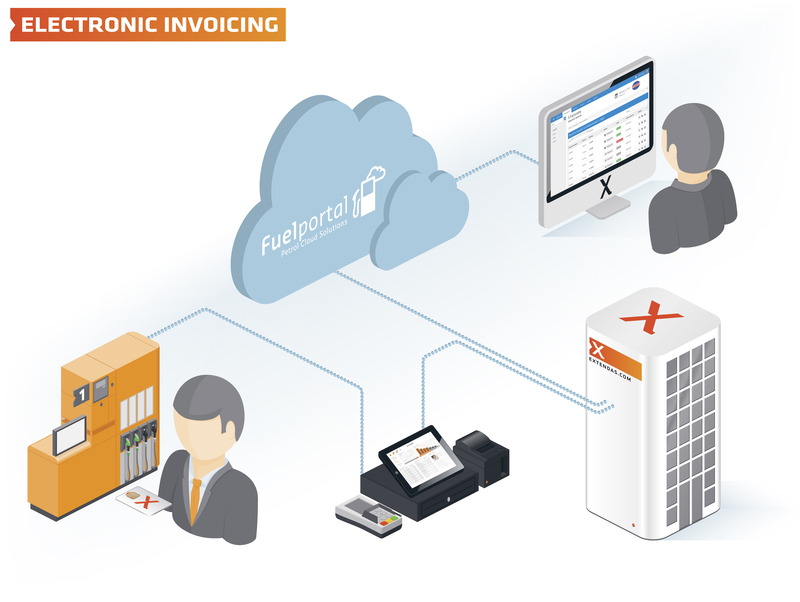 e-Invoicing with FuelPortal is easy via the seamless link with the powerful back office system, FuelOffice. You need only identify which customers should receive an e-invoice and the system implements the process itself. When you start an invoicing run in FuelOffice your e-customers receive an e-mail informing them that they can access their new invoice on the FuelPortal cloud platform. After login your customers enter a portal that can be designed in your own house style. The default invoice is a PDF. They can also be made available in UBL 2.0 format or any other format. This allows the customer to scan the invoices directly into his administration system. The e-invoice is equipped as standard with the required electronic signature. Your customers can also compile tailor made fuel purchase reports via the platform. This allows taxi companies and transporters to see exactly how much and when their drivers refuelled – and to detect fraud. FuelPortal also offers opportunities for loyalty programmes, such as petrol card applications and querying and redemption of loyalty points. Or how about an automatic newsletter – with an offer for all customers who have not visited your petrol station recently? FuelPortal also acts as an electronic invoice archive for the Dutch Tax and Customs Administration. Both the portal and the invoice archive are securely hosted with an ISP that works according to the ISO 27001 standard. This is the highest certification for information security. This gives you a hard guarantee that the hosting of the web environment takes place in a safe and well-managed environment.